The Samsung Galaxy Note runs Android 2.3.5 Gingerbread with TouchWiz on top. Unsurprisingly, the interface looks a lot like that of the Galaxy S II only bigger. The always-visible shortcuts at the bottom of the screen are now five (instead of four) and the main menu grid has been expanded to fit a 5x5 grid of icons (vs. 4x4 in the S II). It all makes sense: the extra space was there and they used it. Other than that, the experience is the same as the phone-based TouchWiz. We won’t cover it in detail in this preview. We'll take a look at the S Pen related apps instead. For preliminary performance benchmarks, you can check out our blogpost. The regular TouchWiz Calendar gave way to the S Planner. It looks and behaves a lot like the vanilla app, but with some adjustments to accommodate the stylus and some general usability improvements. The days of the month fit nicely on the huge screen and they are very easy to hit with the stylus. This will highlight the date and you'll see all events for that day in the scrollable area below. The squares for each day are big enough to fit the first word of the title of up to two events. Subsequent events show up as "+1", "+2", etc. showing up in the upper right corner of the square. When adding an event, you have three options: Quick add (just a quick text note), Add event (which lets you add anything from reminders and memo to photos and locations) and Add task, which handles your To-Do list (you can assign each task a priority, due date, group and so on). The S Planner can seamlessly sync with multiple calendars. The S Memo is very similar to the Memo app we're used to seeing in TouchWiz. 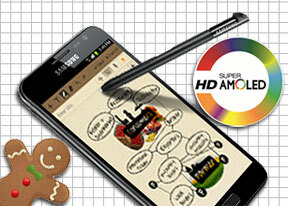 The difference is that S Memo has extensive support for scribbling down notes and quick sketches using the S Pen. The app opens upon an empty canvas (with a square grid like notepaper) and lets you draw with the S Pen, enter text with the keyboard, add images (which can be scaled for fit) and voice notes . You can choose between a pen, a brush, a pencil and a marker, each of which leaves a slightly different mark. You can adjust the thickness and the color. Other tools that might come in handy are the eraser, Undo and Redo buttons a Lock button to prevent accidental edits and the Favorite button to mark important notes. The S Memo app supports pinch zoom, so if you zoom in you have plenty of room to work with and then you can zoom out to get an overview. Panning around isn't very convenient as you have to manually enable pan mode and disable it after. Two finger panning or something would have been easier. The S Memo lets you easily keep notes visible: you can put them on the homescreen as a widget, set them as lockscreen or homescreen wallpaper or even as a contact's photo to remind you next time you call (or get called by) that person. With the Samsung Galaxy Note you have two options for text entry – the on-screen QWERTY and the handwriting recognition keyboard. The standard method, QWERTY, is probably our favorite. The Galaxy Note is sized exactly right for holding it with two hands in portrait orientation and typing with both thumbs. If your hands are bigger, you can do the same in landscape. Either way, you're left with plenty of room for the text and the keys are big and very easy to hit. For speedy text input, this might be the fastest option available on the Note. The other option on the Galaxy Note is handwriting recognition using the S Pen. There's a "pen" icon on the QWERTY keyboard so you can quickly toggle that mode and the first time you start it, you'll be presented with the Gesture guide. In some apps (e.g. the SMS composer) you can just start writing away on the text area. The word suggestions bellow will help you out at first while you get the hang of it. Other apps (like S Memo) present you with a dedicated writing area at the bottom half of the screen. There's actually a third option - Swype - which comes preinstalled with the Samsung Galaxy Note. If you're used to Swype, there's a chance you'll be even faster on the big screen. You can enable Swype in the Settings.